Free Shipping Included! VIVO White Height Adjustable Desk for Children | Kids Smart Interactive Ergonomic Sit Stand Work Station (DESK-V221) by VIVO at Indsight. MPN: DESK-V221. Hurry! Limited time offer. Offer valid only while supplies last. Smart adjustable workspace for children (DESK-V221) from VIVO. This sleek, heavy duty desk combines fun and safety for kids of varying age and size! Smart adjustable workspace for children (DESK-V221) from VIVO. This sleek, heavy duty desk combines fun and safety for kids of varying age and size! Add this desk to your child's study or play area for a comfortable work and activity space. The desk has a white laminate frame and is height adjustable to keep up with your fast-growing child. Ergonomically designed for adjustability and practicality, DESK-V221 is recommended for children of all ages. Clear safety padding is included for each corner. Assembly is an easy process and we provide the necessary tools, hardware, and instructions. Once assembled, the desk is easy to move if need be. 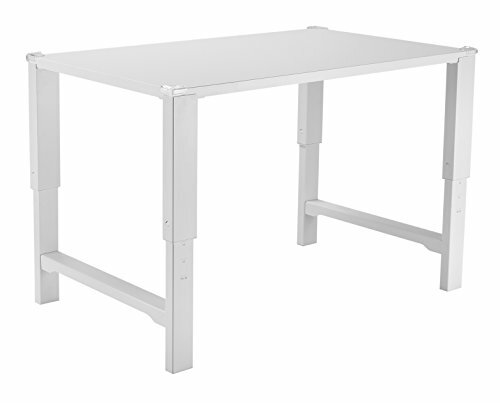 The table surface measures 40" x 24" and the height of the desk can be adjusted from 23" to 29". To reset the height, simply raise the table surface to the highest level and then lower all the way down. SPACIOUS WORK SURFACE - The 40" x 24" table surface provides lots of space for study and creative activities including reading, coloring, arts & crafts, and more!